Never underestimate the desire of parents to see their children as dumb. We see our children at their worst moments in the course of their lives ... it’s very easy to imagine our children as failures -- and because they go into worlds that are unfamiliar from our own childhood, we see them in some ways as threatened. That creates a context where as a parent you’re looking at young peoples' engagement with this technology and there’s a sense of fear ... because as a parent you fall back on -- in these moments of crisis -- the things you were taught and the world you grew up in. And that sense of a conservative reaction to things that were alien to your experience is a very real-world one. It only takes one instance — a Columbine or a Virginia Tech shooting -- and what comes out of that is the beginnings of a moral panic. A moral panic is what happens when you stop asking questions because you assume you know the answers. There are new literacies that are emerging in this generation that are so powerful, but that parents don't understand. So...just who is Henry Jenkins? Henry Jenkins is the Director of the MIT Comparative Media Studies Program and the Peter de Florez Professor of Humanities. He is the author and/or editor of nine books on various aspects of media and popular culture, including Textual Poachers: Television Fans and Participatory Culture (1), Hop on Pop: The Politics and Pleasures of Popular Culture and From Barbie to Mortal Kombat: Gender and Computer Games. His newest books include Convergence Culture: Where Old and New Media Collide and Fans, Bloggers and Gamers: Exploring Participatory Culture. One of my proudest accomplishments so far in life has been the creation of the Comparative Media Studies (CMS) graduate program at MIT. At its core, this program encourages students to think across media, across historical periods, across national borders, across academic disciplines, across the divide between theory and practice, and across the divides between the academy and the rest of society. Our goal is simply to train the next generation of leaders for industry, government, education, the arts, journalism, and academia to think in more imaginative ways about the process of media change...my own sense is that the academic disciplines which emerged around the problems of the industrial age have outlived their usefulness in a networked culture and that we need to reconfigure the ways we organize and communicate knowledge to our students. Central to the vision of CMS is the idea of "applied humanism." MIT has applied math, applied physics, and applied chemistry so it made sense to me that there should be an applied branch of the humanities. Our goal is to take what we are teaching in our classrooms and give students a chance to apply it more pragmatically to think through some of the core challenges being faced out in the field as core institutions confront media change. I recommend that geeks, gamers and cultural thinkers take a look at his blog: Confessions of an Aca-Fan (AKA Acadamic Fan) and by all means, check out his books. Even I can grok the books. Hat tip to Neil Gaiman, who mentioned Jenkin's blog in his own blog. 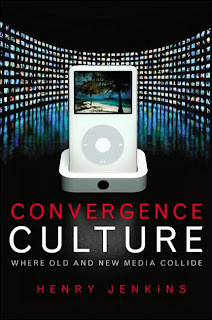 Henry Jenkins, founder and director of MIT's comparative media studies program, debunks outdated ideas of the digital revolution in this remarkable book, proving that new media will not simply replace old media, but rather will learn to interact with it in a complex relationship he calls "convergence culture." The book's goal is to explain how convergence is currently impacting the relationship among media audiences, producers and content, a far from easy undertaking. As Jenkins says, "there will be no magical black box that puts everything in order again." Jenkins takes pains to prove that the notion of convergence culture is not primarily a technological revolution; through a number of well-chosen examples, Jenkins shows that it is more a cultural shift, dependent on the active participation of the consumers working in a social dynamic. He references recent media franchises like Survivor, The Matrix, and American Idol to show how the new participatory culture of consumers can be utilized for popular success and increased exposure. Jenkins' insights are gripping and his prose is surprisingly entertaining and lucid for a book that is, at its core, intellectually rigorous. Though wordy at times, Jenkins' impressive ability to break down complex concepts into readable prose makes this study vital and engaging. Drawing on a rich theoretical background with sources ranging from feminist literary criticism to cultural anthropology, [Jenkins] applies and adapts Michel de Certeau's model of poaching, in which an audience appropriates a text for itself. Taking a stand against the stereotypical portrayal of fans as obsessive nerds who are out of touch with reality, he demonstrates that fans are pro-active constructiors of an alternative culture using elements poached and reworked from the popular media.